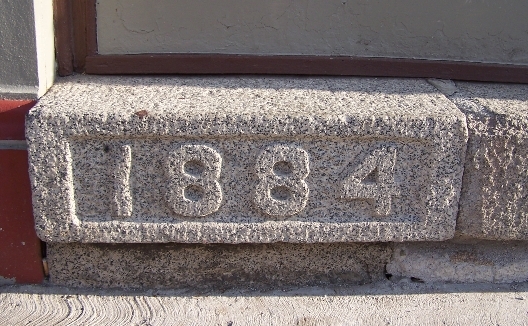 John G. Hammer, bookkeeper with the John Caplice Company, built this house as a one-story residence before 1885; the early address was 163 W. Granite. Hammer established and became manager of the Butte Sewer-Pipe & Tile Company in 1889, and was successful enough that in 1899 he added the second story to his home. He continued to manage the company and live here until 1912, when he moved to Portland, Oregon where he purchased an $11,000 home at 530 East 17th Street North. In 1910, Hammer’s daughter Florence and her husband Terry John also lived here. Florence worked as a bookkeeper for the tile company until at least 1920. Another daughter, Alberta, married William Siderfin, manager of W.A. Clark’s interests in Butte. John Hammer was secretary of the Butte Chapter of the American Institute of Mining Engineers in 1887, when W. A. Clark was its President. Hammer was born in Saxony, Germany, about 1849 and died about 1913. Julia, his wife, was prominent in Portland social circles and died there July 1, 1935. In 1907, Hammer’s brick plant south of Silver Bow Creek was producing 5,500,000 bricks per year. The clay was mined locally (fireclay was mined near Whitehall after 1902), and the main plant was located west of Montana Street, west of the cemeteries south of the creek. The tile shop stood at Oregon and Second Avenue. In 1928, Mancel (sometimes given as Myrle) Larson was living here. 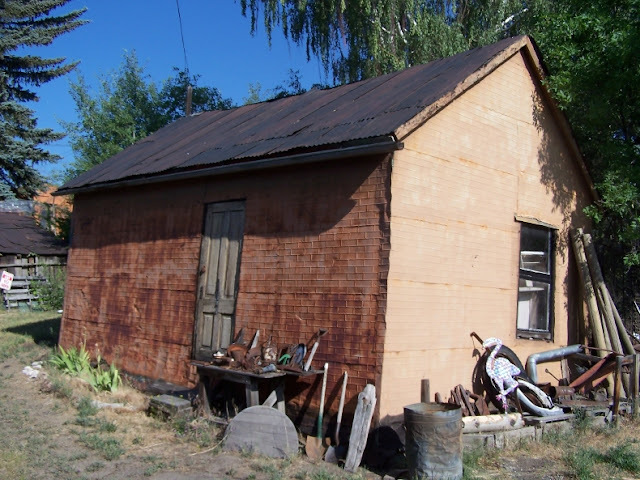 He was a shift boss for the Anaconda Copper Mining Co. As the Great Depression began to take its toll, large houses like this one became boarding houses. Larson began to take in boarders about 1935; in 1937, when he worked at the Emma Mine, his tenants were Maybelle Baird (widow of James), a stenographer for the Montana Service Corp., a dealer in dairy products; Katherine McDaniel (widow of John), a nurse, and her daughter Marie, a student at Butte Business College; Maud Maloney (widow of William); and Helen Curtis (widow of Charles), head of the County Child Welfare Department. By 1940 all but Baird were still living here, and Walter Thomas; Ray and Lumina Rowan (a salesman and cosmetics representative, respectively); Wendell and Ardell Peck (he was another salesman); and Violet Blecka all called this house their home as well. Even in 1948, at least nine people lived here: Ernestine and Clifford (ACM mining engineer) Clifton; Alta Spain (public school teacher); Hazel Andrus (cashier, Finlen Hotel); Beatrice and Hal Hennigh (beauty parlor operator and barber); Jean and Ivan Nevans (he was a clerk); and Alyce O'Connor, a nurse at St. James Hospital. Resources: Architectural inventory; Sanborn Maps; city directories; Brick and Clay Record, Volumes 26-27, June 1907, article by J.P. Rowe, p. 291; Anaconda Standard newspapers; AIME Transactions, 1887; Progressive Men of the State of Montana (1901). Photo by Richard I. Gibson. This Italianate home complements the larger, but similar one across the street. 318 West Granite was built between 1884 and 1888, and was home to John Wesley Reed, a dentist with an office on the second floor of the building on the southeast corner of Main and Broadway (parking lot north of BS Café today) in the late 1880s and early 1890s. 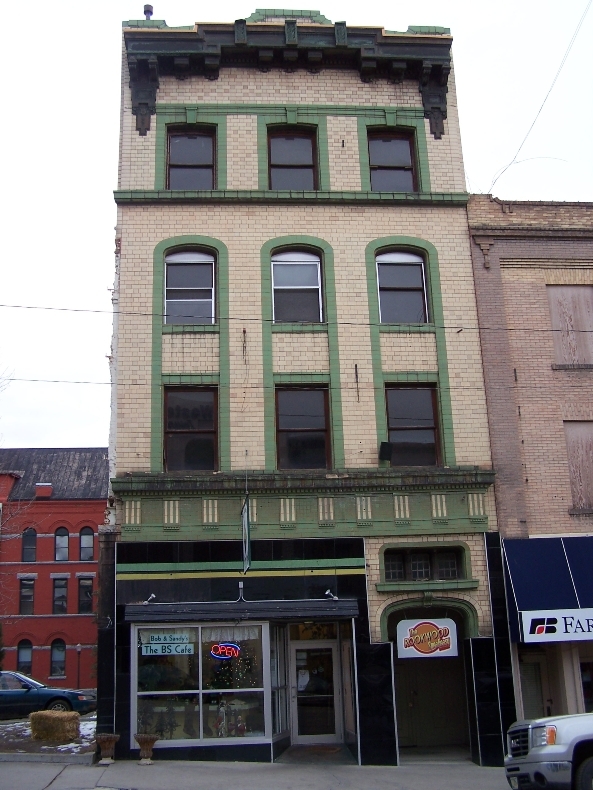 By 1900 his office was 115 N. Main, the second floor of the Dellinger Block. He continued to live at this house until after 1900, but was not listed in Butte in 1910. Dr. Reed was born March 27, 1838, in Boone County, Missouri. He graduated from the Pennsylvania College of Dental Surgery in 1877, and practiced a few years in Mexico, Missouri, where he served in various officer positions with the Missouri State Dental Association. Reed came to Butte in 1882, and was the first President of the Montana Dental Association. The address of this house is sometimes listed as 316. 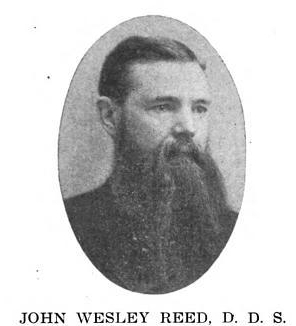 Resources: Architectural inventory; Sanborn Maps; city directories; Biographies of the founders, prominent early members and ex-presidents of the Missouri State Dental Association, by Burton Thorpe (1909) - source of photo of Reed. House photo by Richard I. Gibson. The western half of this house (312) was constructed before 1884 as a small home with a Mansard roof and stone basement. 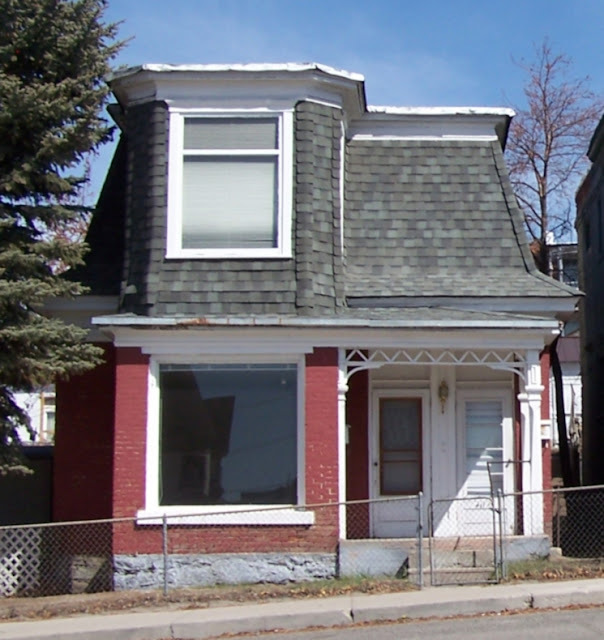 It was owned initially by Butte City Attorney Howard B. Smith, who lived here when the address scheme had it as 161 West Granite. 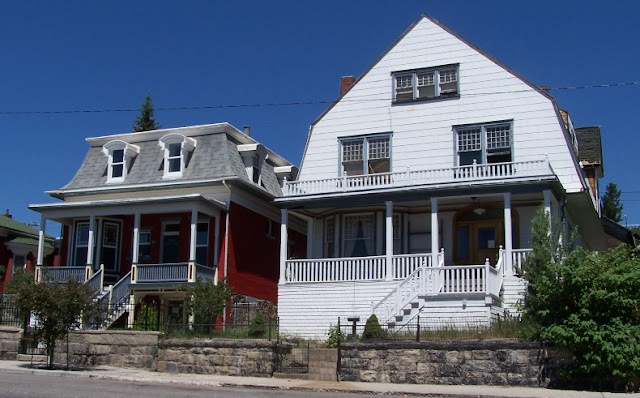 The house was doubled in size between 1888 and 1890 by the addition to the east (310) and the filling out of the second floor, making the building into a duplex. 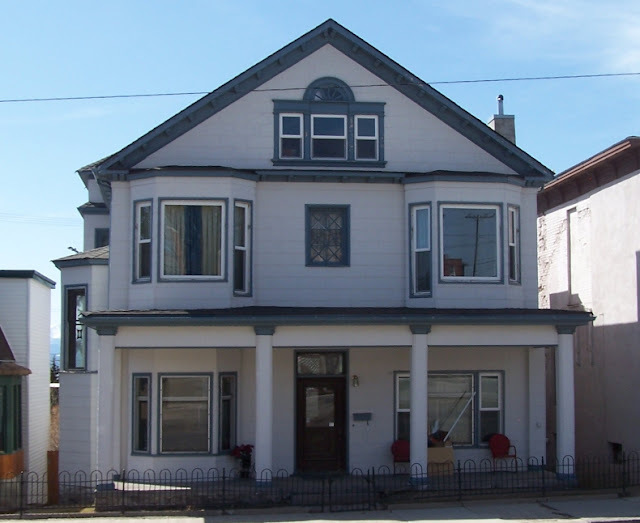 The James Lynch family lived at 310 in 1907; Mrs. Lynch was active in the Ladies Aid Society of the Welsh Church. 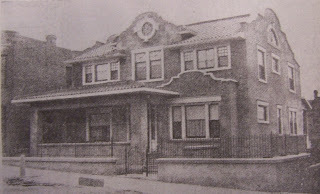 From before 1907 to the late 1920s, 312 was the home of Mary and Hayes Cannon. Hayes was a partner with Archibald McMillan, “Real Estate Etc.,” with offices at 1 West Broadway (the First National Bank building). The Cannons’ daughter, Edna, was married to Frank German in this house Oct. 6, 1908; the ceremony was performed by Pastor E.J. Groeneveld of the First Presbyterian Church. Hayes died about 1927 and Mary continued to live here at least until 1937. Resources: Architectural inventory; Sanborn Maps; city directories; Anaconda Standard newspapers. McMillan and Cannon ad from 1910 City Directory. Photo by Richard I. Gibson. Intricate, original ornamental metal cresting caps the dome on the octagonal tower of this handsome 1,514-square-foot residence. Its eclectic architecture combines elements of the Queen Anne and French Second Empire styles. A partial Mansard roof at the northeast corner and a front window with unusual stone quoins and brick surrounds reflect the flamboyant tastes of the late Victorian era. The tower retains its original, charming multi-paned cottage window. 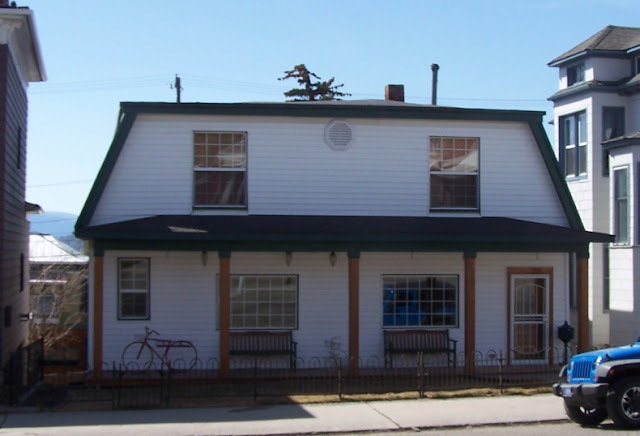 Albert MacCallum (MacCallum & Cloutier Grocery) built the residence as a rental property in 1895 and sold it in 1904 to miner, politician, and businessman Dennis Roach. Roach came to Montana from Indiana in 1889. The firm of Roach and Smith offered billiard tables, a confectionery, flowers, fishing tackle, sporting goods, cigars, and sundries. Roach and Smith, one of Anaconda’s longest established businesses, still exists as a wholesale distribution firm. Dennis Roach served as county commissioner and as a representative in the Montana legislature. After Roach’s death in 1925, his widow Maude remained at home here for more than thirty years. The porch was enclosed and an addition built in the 1940s. The Roach's daughter, Katherine “Kash” Felt, a prominent and well-loved Anaconda matron who served on many local boards, converted the residence into classrooms where she taught kindergarten. She died in 1999 at age 95, and the family retained ownership of the property into the twenty-first century. It had stood vacant for many years until it was purchased in January 2013. Extensive repairs and restoration are in progress in 2013. Sources: Historic plaque by Montana Historical Society; Northwest Tour: Anaconda, Philipsburg, Deer Lodge, Vernacular Architecture Form 30th Annual Meeting, Butte, Montana 2009, Roach House text by Dena Sanford; obituary, Anaconda Leader, July 7, 1999. Photo by Kathy Koskimaki Carlson. Additional “before” photos may be seen here. The elegant Mansard roof on this home marks it as French Second Empire style. It was constructed as a two-story duplex home before 1884. In the early 1890s tailor Walfred Hoover lived in the western unit (then addressed 311). He worked for Henry Jonas, a merchant tailor with a shop at 126 North Main, where part of the Hennessy Building stands today. Patrick Conlon, proprietor of the Arcade Chop House, purchased this house in 1889. It is not clear whether or not he lived here initially, because his address is listed at 518 North Main at least through 1900, but from before 1910 until his death Conlon lived in this house. He died at home here May 17, 1921, after a short illness, at age 83. Conlon was close friends with Marcus Daly, James Murray, John Maguire, and other prominent Butte pioneers. Patrick Conlon was an Irish patriot and member of the Robert Emmet Literary Association in Butte, a revolutionary organization fighting for Irish independence. He was born in County Mayo, Ireland, in 1838, and emigrated to the United States in 1853 at age 15. He traveled by steamboat up the Missouri to Ft. Benton, arriving in Montana July 4, 1864, and came to Butte in 1878. He was a founder of the Butte Branch of the Irish National League of America in 1883. Conlon donated $20.00 in 1885 to the Parnell Fund, a response to Charles Parnell’s visit to America promoting Irish home rule. That was at a time when $20 would have bought at lest 40 really good dinners in a high-end restaurant. The Arcade Chop House was a restaurant on North Main, in existence by 1878 when John Mann was proprietor. Conlon apparently managed it through most of the 1880s, until 1889 when Henry Mueller & Co. took over. Mueller held various offices with the Centennial Brewing Company and was Butte Mayor in 1891. The Arcade Chop House addresses, variously 209 or 269 Main, and 31 North Main, probably reflect the same location, with the changes due to alterations in the address scheme. I believe the location was in the middle of the block between Park and Broadway, on the west side, where the 1891 Avalon Block (former print shop) stands today. That was the 200 block in the 1880s. It is possible that the shop began in a building nearer the corner of Broadway (where the D.A. Davidson building is today) and moved a few doors south by 1889, but in any case the original building or buildings that housed the chop shop are gone today. This house was restored about 2005. It suffered minor damage in the 2008 fire that destroyed 307 West Granite, next door to the east. Resources: Architectural inventory; Sanborn Maps; city directories; The Butte Irish, by David Emmons, p. 303; History of Montana 1739-1885, by Michael Leeson (1885); Anaconda Standard, May 17, 1921, obituary. Photo by Richard I. Gibson. 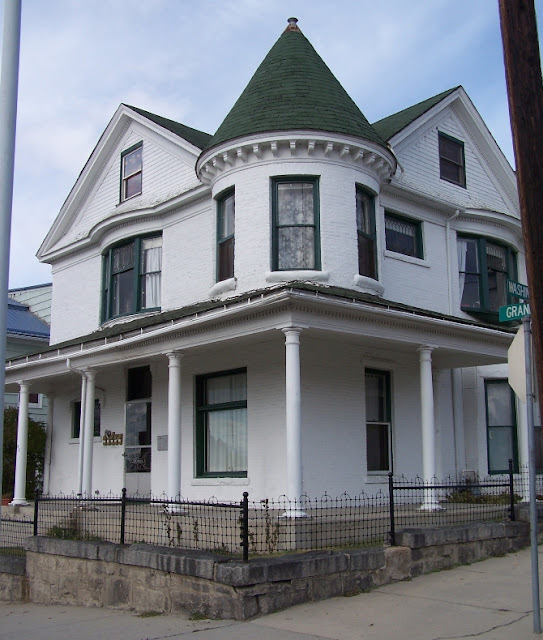 This Italianate style home was built between 1884 and 1888 for Thomas Fletcher, a bookkeeper with the Clark and Larabie Bank (southwest corner of Broadway and Main). By 1888, all the houses on the south side of the 300 block of Granite Street had been constructed, and all six survive today. Resources: Architectural inventory; Sanborn Maps; city directories. Photo by Richard I. Gibson. Alfred Holmes, manager of the Butte Trading Company, was an early owner and resident here. The house was built by 1884, and the enclosed front porch is a relatively modern addition. The Butte Trading Company was a hardware business. On August 11, 1890, Shelley Tuttle purchased the stock of goods and merchandise of the Butte Trading Company for $47,000. The Tuttle Company was a foundry, but expanded into other businesses in the 1890s. It was ultimately merged into the Anaconda Company’s foundry, which in turn became the Anaconda Foundry and Fabricating Company, or AFFCO, which exists today. 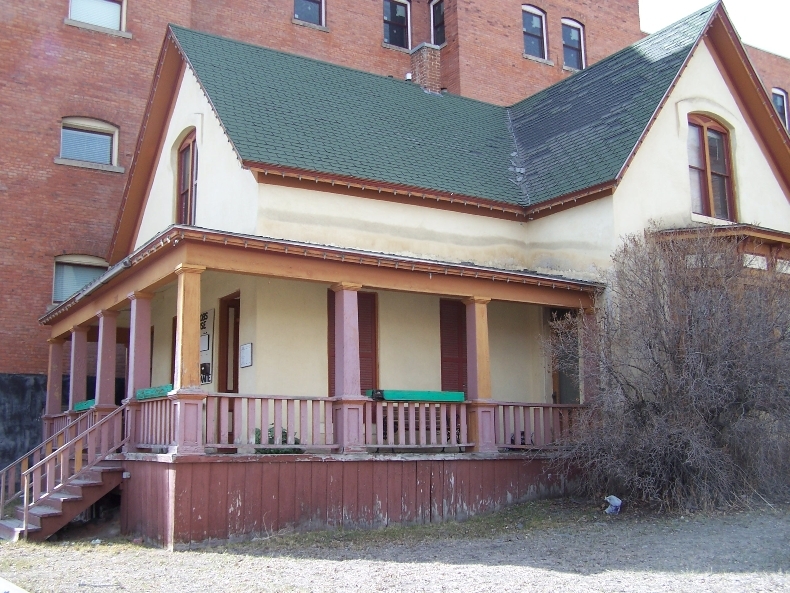 Following the takeover of Butte Trading by Tuttle, Alfred Holmes served as Tuttle’s manager in the early and mid-1890s when he lived in this house. Tuttle’s main office and store was in the 300 block of North Main at that time. Resources: Architectural inventory; Sanborn Maps; city directories; AFFCO history. Photo by Richard I. Gibson. This was William Thompson’s home, built by him circa 1884. He was born in Ontario, Canada, March 1, 1838, was in Virginia City, MT in 1863, and moved to Butte in 1879, the year the city was incorporated. He established the Butte Lumber Yard (219 S. Montana, the entire block between Galena and Mercury on the west side of Montana Street) and by 1891 was Vice-President and General Manager of the Montana Lumber & Manufacturing Company. Together with his sons he started the Thompson Investment Company in 1889, a building company that erected many of the small homes in Butte. He served as Butte’s mayor in 1895-97, and was also a territorial and state legislator, helping draft the Montana state constitution. By 1900, he was living with his son James at 1101 Caledonia. He died May 15, 1900. Mining claims south of Butte owned by the Thompson family were donated to the city of Butte by Col. William Boyce Thompson, in honor of his father, William Thompson. The son had been raised in Butte and founded the Newmont Mining Co., a global mining company still in existence today. Thompson Park was officially designated as a park in 1915. The street face of this house retains its original geometry, including the porch. Resources: Architectural inventory; Sanborn Maps; city directories; Thompson Family History; and “2012-07-26 Thompson Park Grand Re-Opening,” by US Forest Service. 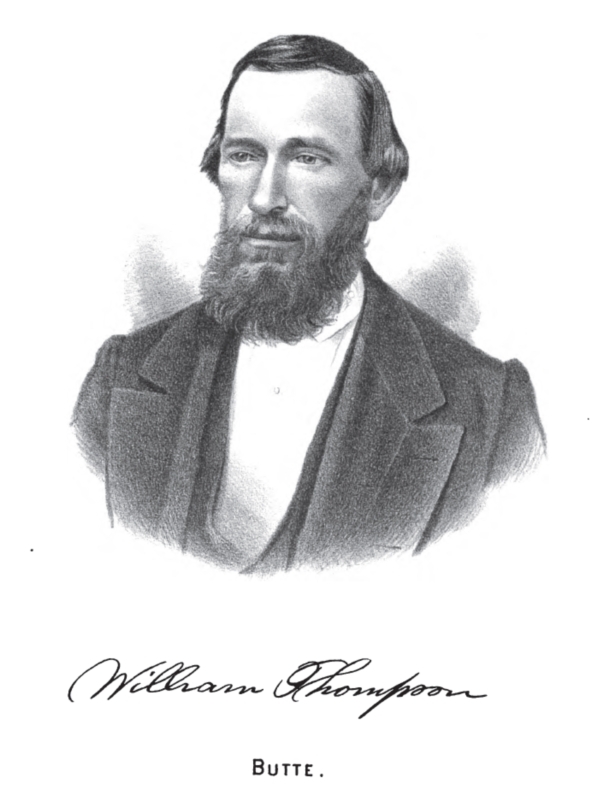 Image of Thompson from History of Montana, 1739-1885, by Michael Leeson (1885). Photo by Richard I. Gibson. 307 West Granite, at right. This is a vacant lot today. Patrick Deloughry, a carpenter at the East Gem Mine, built this house to replace a pre-1888 single-story brick veneered home that stood here. Deloughry lived almost across the alley behind this site, at 310 West Quartz Street. William Waugh, a lawyer, and Jeanne Stewart, an art teacher, lived here at least from 1928 until 1937. After World War II, the house was converted to apartments, and in 1948-49 at least 13 people lived in this home. They included Pearl Rowe (widow of James); Lois Johnson (dictaphone operator for the Texas Company, dealer in oil and lubricants); David Bell (miner); Corrine Gutz (widow of Walter, she was head of the ACM Publicity and Information Office); Ole Nelson (steward, Eagles Club); Martin Makeli (student); Mable Fletcher (practical nurse); Kate & James Rockefeller (he was a clerk); Margaret & Henry Freudenstein (another clerk); William Dagg (an announcer); and William Graham (cook at the Finlen Hotel). In 2008, ten tenants were occupying eight apartment units when a smoldering cigarette started a fire that destroyed the building on July 29. Estimated rebuilding costs of more than $500,000 were not covered by insurance, and the building was demolished. Resources: Architectural inventory; Sanborn Maps; city directories; online record of law suit between owner and insurance company. Photos by Richard I. Gibson. This house was constructed in 1898 by the Thompson Investment Company, which built many of the smaller miner’s cottages and other homes in developing Butte. The front porch, which formerly extended the width of the building, was added before 1916. 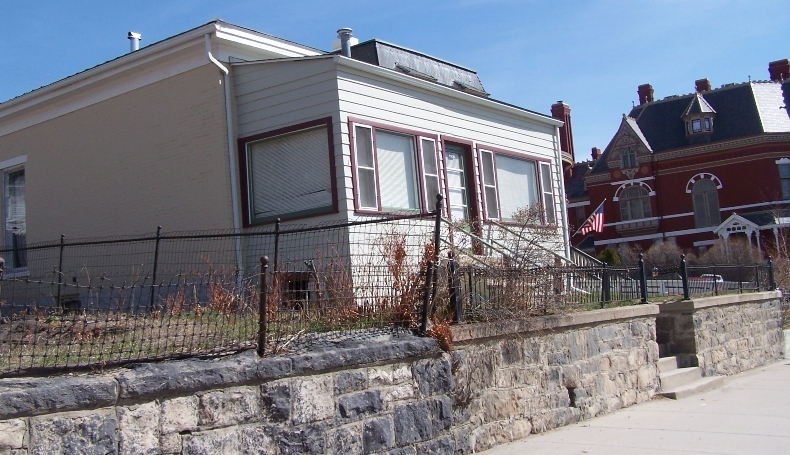 This house replaced a single-story frame building that had stood here at least since 1888. The original owner was H.C. Hopkins, although he appears to have died or left Butte by 1900. There were other Hopkins nearby; Olivia, widow of Robert P. Hopkins, lived at 413 West Granite at least from 1893 to 1899 when she moved to San Francisco. Since there is no 413 West Granite address, and because the address scheme changed during the 1890s, it is possible that Olivia and Robert actually lived at the 409 address. More research is needed on the Hopkins family of West Granite Street. Behind this house, on the alley, in 1888 were two large “stove warehouses” that belonged to William Jack, a dealer in stoves, hardware, and pumps who lived at 403-405 West Granite. 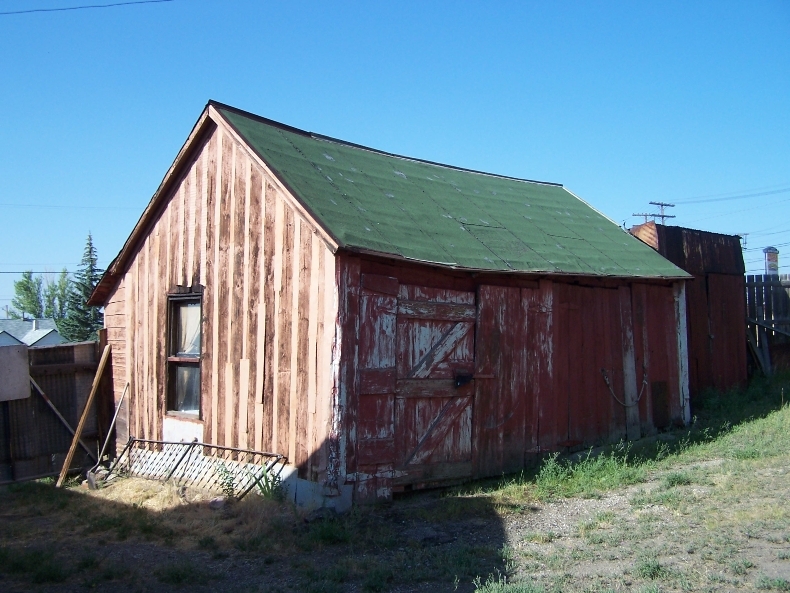 In 1890, a carpenter’s shop (possibly moved from the rear of 411 W. Granite) and alley dwelling stood behind this home, and from some time before 1916 until after 1957, five tin-clad “cabins” were in the back portion of this lot on the alley, addressed 409½ and presumably crude dwellings of some sort. They were “vacant and dilapidated” in 1951 and 1957. This Second Empire style home was among the earlier houses built this far west on Granite Street, erected between 1884 and 1888. The original owner, who built it for himself, was contractor James D. Jenks. From the beginning the house was two flats, one upstairs and one down, and there was also an alley house behind this building, addressed 411½. Built about 1890, the latter replaced a carriage house and carpenter’s shop that stood on the alley in 1888. That alley dwelling was gone by 1951 and the duplex carried the two addresses, 411 and 411½, as it does today. James Pratt, proprietor of the Red Boot and Shoe Company, spent $30,000 on the construction of this hotel/rooming house in 1912, replacing a building destroyed in the Creamery Cafe fire. The shoe company occupied the ground floor space through the 1930s. Large display windows and a Tudor-arched entry, designed to entice customers and guests, enhance the ground floor. Green tile embellishes the façade and caps the unique copper-clad cornice. Inside, a wrought iron staircase with marble treads leads down to the hotel lobby. Marble wainscoting recalls its once-elegant hospitality. The ground floor also housed “The Town Talk Tailor” for several years in the early 1930s. The lodging house above, renamed the La Salle Hotel in 1938, had more than forty-five rooms. During Prohibition from 1919-1933 the hotel’s thirty working-class lodgers perhaps enjoyed the hidden saloon tucked beneath the sidewalk. Known to historians but rediscovered in 2004, the clandestine establishment in the basement had all the trappings of a period speakeasy including a secret entry and two-way mirror. The room continues the architectural motif with decorative Tudor arches spanning the ceiling. Elaborate support columns sporting carved griffins, terrazzo flooring, dark hardwood wainscoting, remnants of stained-glass skylights, and marble trim expose a piece of Butte’s once-spirited underground. We know of one raid here, by Federal agents in March, 1928, when Curly McFarland was arrested. The residential hotel portion of the building was effectively vacant by the late 1980s. A ground-floor restaurant continues here in 2013, but apart from the speakeasy museum in the basement, the rest of the building is vacant. Text modified from historic plaque by Montana Historical Society. Photo by Richard Gibson. “For years, it has been almost impossible to accommodate all the people with comfortable houses or apartments,” a Butte newspaper reported in 1901. “The city is growing very fast, and the builders have all they can do to put up enough buildings to accommodate them all.” This block is a case in point: only two residences stood here in 1891, but almost every lot was filled by 1900. Saloon owner Frank Lynch and his wife Fannie were among those to have a home built for them here in the 1890s. 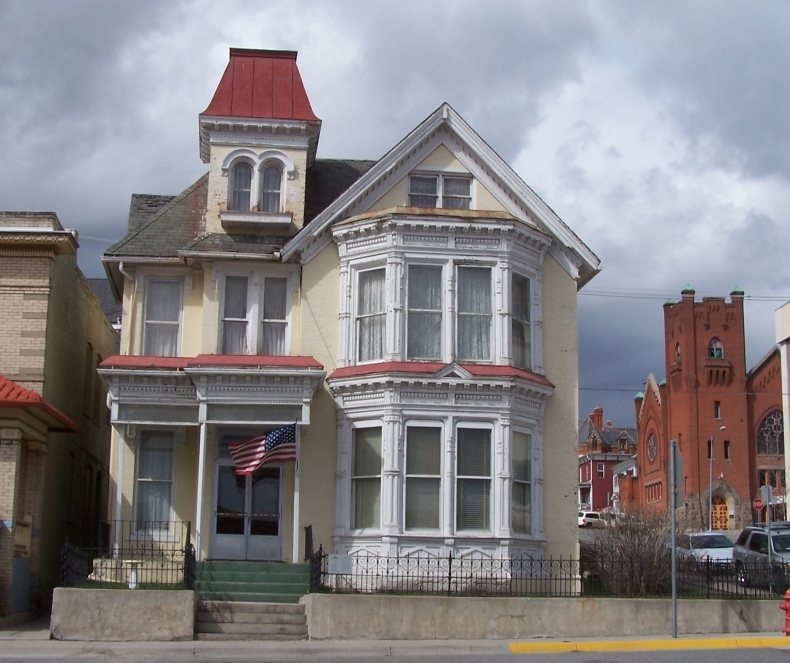 Frank worked as a bartender in Butte as early as 1889; by 1896 he and his brother owned their own saloon, and Frank was prosperous enough to hire prominent Butte architect H. M. Patterson to design this one-and-one-half-story, brick-veneered residence. The charming Queen Anne style home features decorative shingles, multiple bay windows, turned porch supports, and stained glass. The basement contains an outcrop of the granite that underlies all of Butte. In back was a second small house—likely rented to relatives. The project was a small one for Patterson, whose designs include several grand commercial buildings on West Broadway. The Queen Anne style is beautifully expressed in this fashionable “gay nineties” residence of Arthur H. Mueller, longtime president of the Centennial Brewing Company. 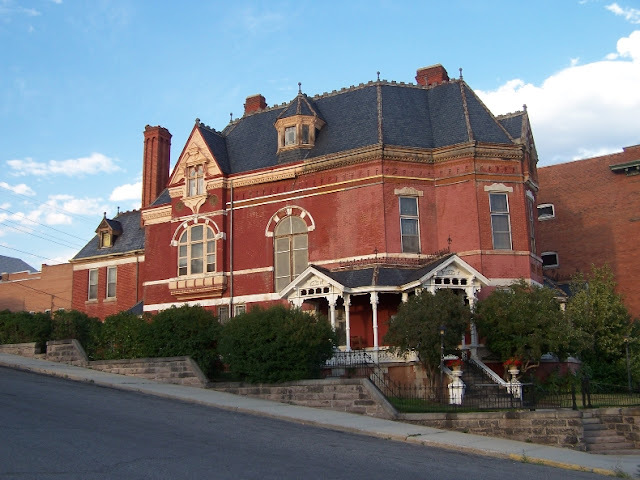 Built in 1895, it was also home to Mueller’s in-laws, police court judge James C. Sullivan and his wife, Margaret. Two turrets, a wraparound porch, oriel and polygonal bay windows, and a gabled roof accentuate the asymmetry that is characteristic of the style. Scrolled brackets, Tuscan columns, and arched windows with stone sills enhance the brick-veneered façade, while an ashlar retaining wall topped by a vintage iron fence encloses the prominent corner lot. Original interior appointments such as elegant mahogany stairwork, woodwork, and columns rival those found in the mansions of the famed copper kings. Pocket doors and the original iridescent amber glass and brass lighting fixtures grace the formal first-floor rooms. A beautiful hand-painted mural in the dining room depicts a river scene so skillfully executed that the water appears to flow through the room and out one wall. A.H. Mueller built the Mueller Apartments in 1917 as an investment. Traveling by stagecoach from Quebec, Canadian-born Thomas Lavell arrived in Deer Lodge in 1874 to join his brother, Geoffrey. The two came to Butte the following year and established a sawmill, providing lumber for the town’s first sawn-wood buildings. With characteristic “push and pluck,” Thomas established the Butte Cab and Transfer Company in the mid-1880s, which grew from a pioneer livery stable to Montana’s largest taxicab and light trucking business. Thomas built this beautiful home for himself and his wife, Melissa, circa 1887. The couple had six children, four of whom survived childhood. 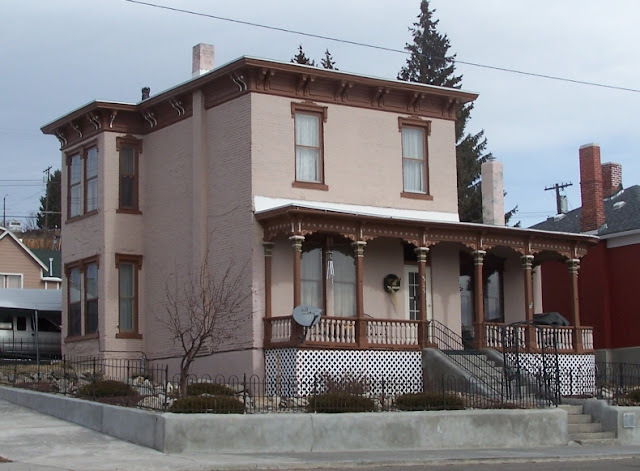 According to the Montana Standard, the Lavells entertained extensively, and their home “for many years was the scene of outstanding social affairs.” A tower with a Second Empire style mansard roof, ornate wooden brackets, and decorative cornices are a lively reminder of fashionable, early-day Butte. Melissa died in 1923 and Thomas, who came to be known as Butte’s “dean of business,” made his home here until he died in 1941. Beautifully detailed and thoroughly cosmopolitan, this $75,000 five-story hotel opened May 5, 1901 featuring over one hundred rooms, a saloon, restaurant, barber shop, and bowling alley. A cast-iron and glass entrance canopy, stone balconies, Tudor arches, and decorative carving highlight the elegant exterior. Turn-of-the-twentieth-century hotel patrons, no doubt impressed with Butte’s metropolitan character, could even take an electric street railway direct to Sutton’s Broadway Theater. 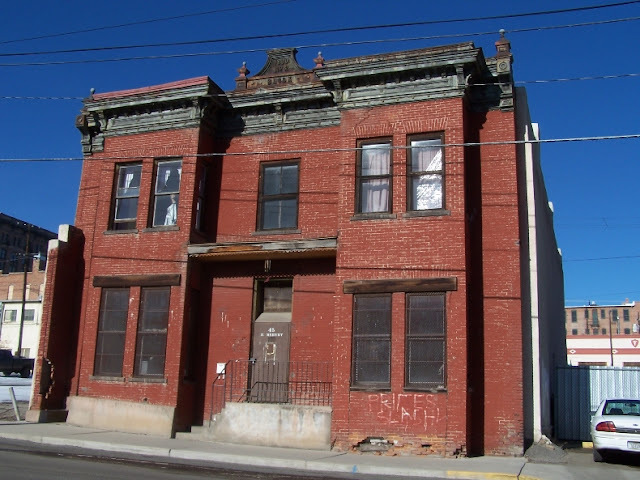 After 1947, the Thornton Block served for many years as a club for Anaconda Copper Mining Company employees. In 2013, this office building also houses Montana’s supercomputer in the basement, where the heat generated by the electronic equipment provides significant energy savings, making this one of the greenest historic buildings in the state. President Theodore Roosevelt attended a banquet here in 1903, and Booker T. Washington stayed here in 1913. Text modified from historic plaque by Montana Historical Society. See also Historic Uptown Butte, by John DeHaas, 1977, p. 52-53 (error in reporting Roosevelt’s visit as 1908; it was 1903). Photo by Richard Gibson. 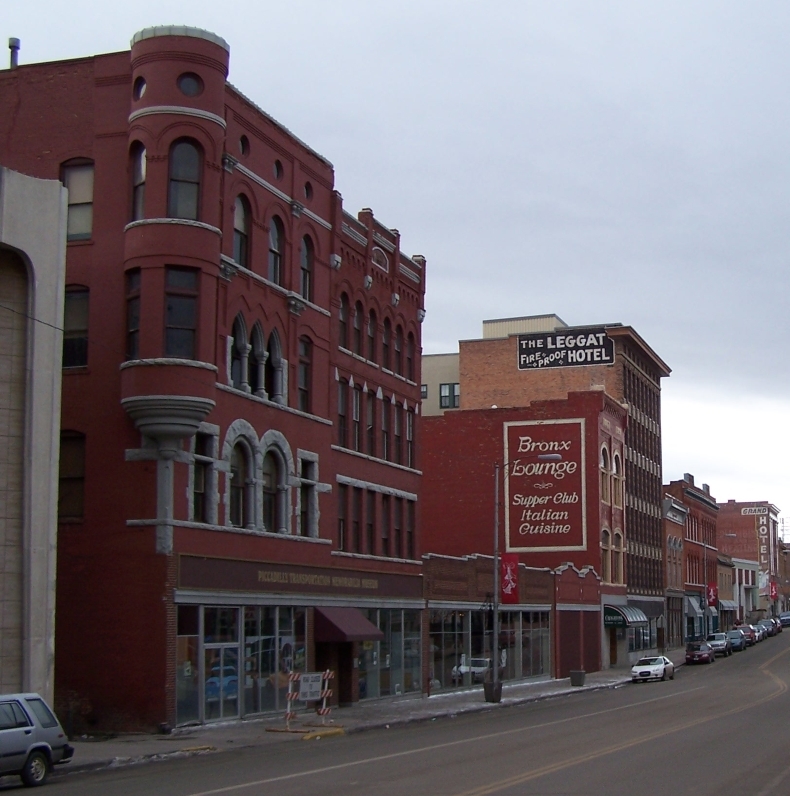 The decade following World War I brought an excess of copper to the world market and Butte suffered a severe economic slowdown. The Finlen Hotel and the Fox (Mother Lode) Theater were the only two substantial structures built in Butte’s business district during the 1920s. New Year’s Day, 1924, marked the opening of this grand hotel modeled in miniature after New York City’s Hotel Astor, a twin-tower building. Because of the economic downturn, the Finlen’s second (eastern) tower was never completed. The nine-story hotel with a French Second Empire mansard roof was designed by architects Shanley and Baker and constructed by Butte builder Albert Broadland. James Finlen, son of wealthy mining pioneer Miles Finlen, financed the building. In 2013, two floors in the historic hotel are available for travelers, while the rest of the building is residential apartments. A hotel stood on this corner for many years. The first, the three-story McDermott, was erected in 1889. 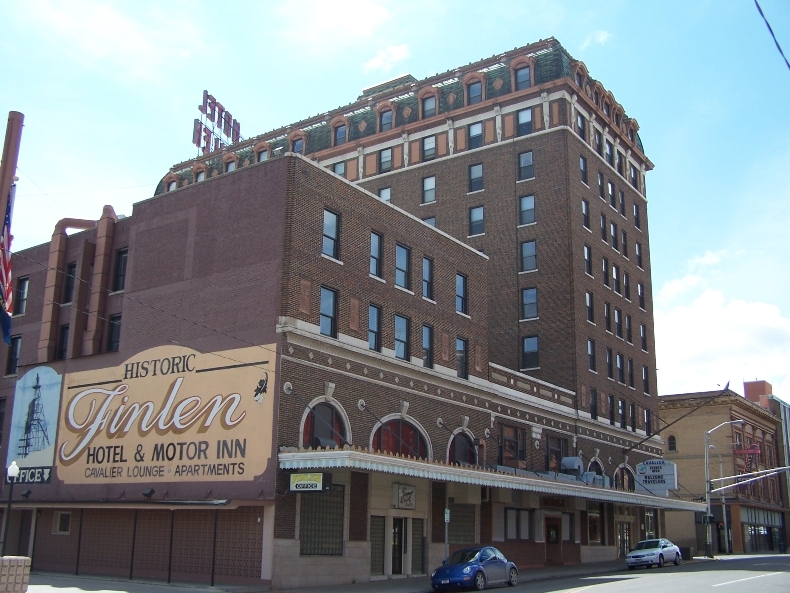 It was purchased in 1902 and renamed the Finlen; the original hotel was demolished in 1923 to make way for the present building. Rooms rented for $2.50 a night in 1948. Guests in this hotel have included Charles Lindbergh, Mrs. Herbert Hoover, Harry Truman, then Senator John F. Kennedy, and then Vice-President Richard Nixon. Text modified from historic plaque by Montana Historical Society. Additional resource: Finlen Hotel. Photo by Richard Gibson. 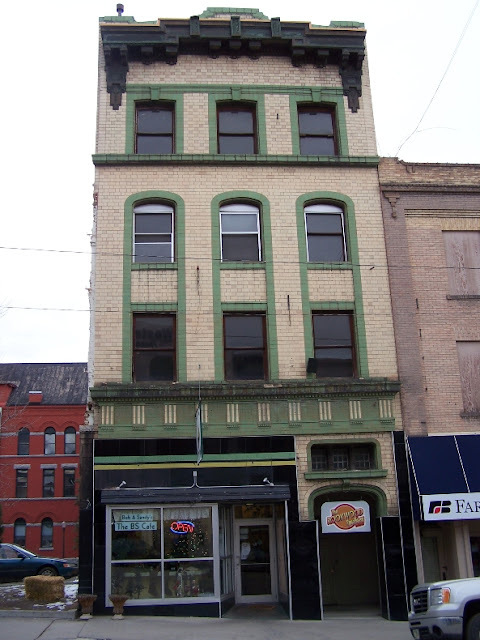 Prominent politician Lee Mantle had this impressive four-story masonry building constructed during 1892, the year he was elected mayor of Butte. Architect H. M. Patterson designed the commercial-residential structure, which incorporates a wealth of decorative architectural forms popular at the time. The curved corner turret and the mixing of stone and brick on the façade reflect Patterson’s distinctive eclectic style. Griffins and scrolls on the capitals between the third and fourth floors enhance the lively treatment of the façade. Remodeling in 1916 to accommodate the building’s long-time occupant, the Liberty Theater, somewhat altered the original storefronts, but fragments of decorative plaster within recall this former use. Baptist Church (foreground); Presbyterian Church in left background. Architect: Charles Passmore & Co.
One of these new buildings was the impressive First Baptist Church, designed and built by Charles Passmore & Company at a cost of $25,000 and dedicated April 12, 1908. Triple-arched windows with beautiful stained glass highlight the main tower, whose pyramidal roof dignifies the neighborhood. Comparison of this church and the nearby Mountain View Methodist Church reveals distinct similarities, but window placement and architectural detailing make each unique. Ford Brothers Glass Co. of Minneapolis fabricated the large round stained glass window on the east side, an example of trace and matte techniques typical of the Munich School of stained glass. Ovals in the south window are opalescent glass. 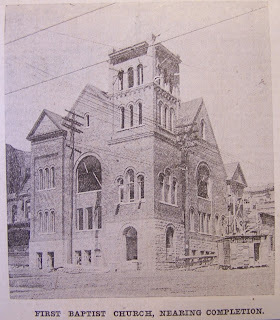 Modified from historic plaque by Montana Historical Society; additional resource: First Baptist Church, by Richard Gibson, in Historic Stained Glass in selected houses of worship, Butte, Montana, published by Butte Citizens for Preservation and Revitalization, 2006; Butte Miner, Dec. 22, 1907 (historic photo). Modern photo by Richard Gibson. A catastrophic fire in 1879 destroyed all evidence of Butte’s first commercial district. 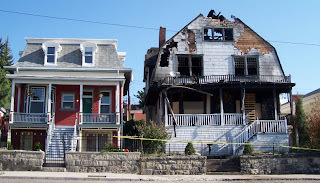 Wooden buildings were subsequently outlawed on Main Street, but even so, fire has altered the commercial landscape in every decade from 1879 to the present. 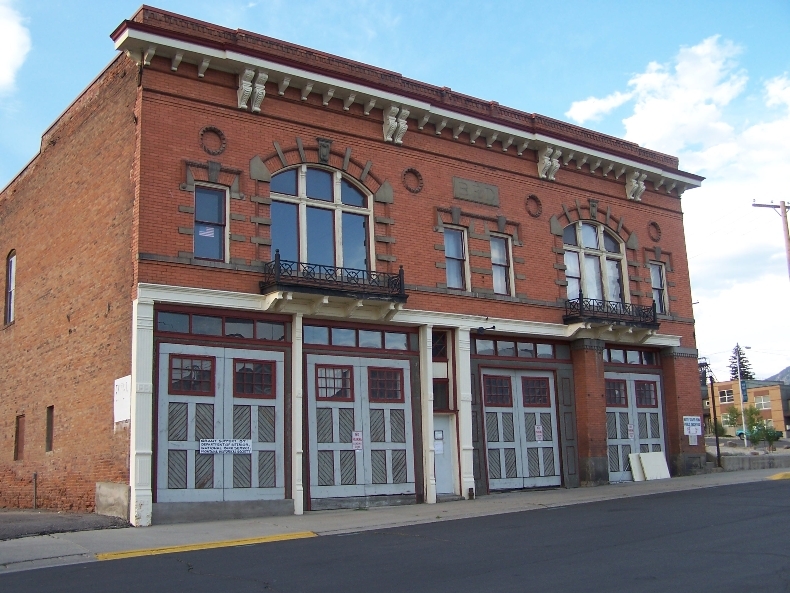 This indispensable community fire hall, Butte’s second, completed in 1900, served as the Butte headquarters until the 1970s. 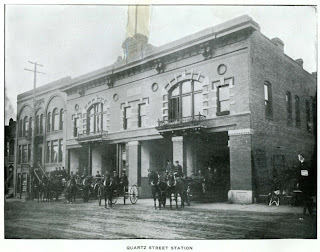 The station, with its three garage bays, housed the fire chief and twenty-two men. A corrugated metal tower above the roof at the rear was used for hanging hoses. Since 1981 the building has housed the Butte-Silver Bow Public Archives. 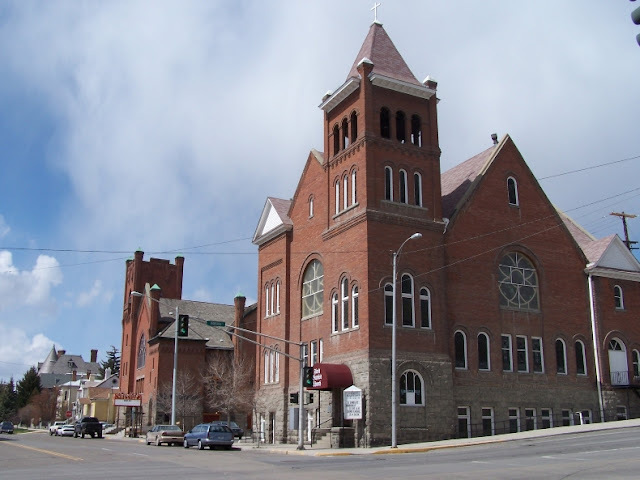 Major renovation of the interior in 2009-10 and addition of a state-of-the-art archival vault to the east made the Archives among the finest in the United States, venue for more than 4,000 visitors per year researching their ancestors and other aspects of Butte history. The fire station has been called one of the most haunted buildings in Butte. Before the 2010 renovation, the fire bells—disconnected for decades—could be heard to ring in the basement. Text modified from historic plaque by Montana Historical Society. 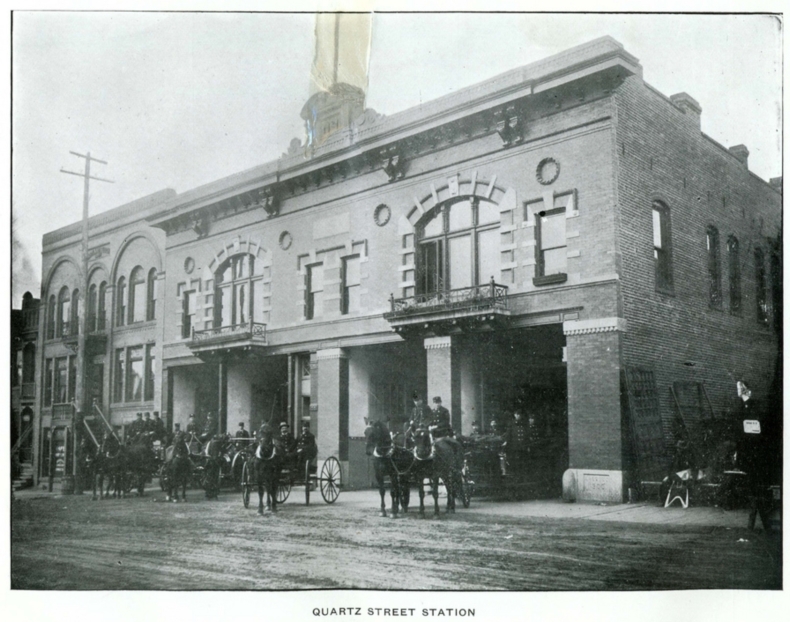 Additional references: The Haunting of Butte's Quartz Street Fire Station, by Ellen Baumler, in Montana, The Magazine of Western History, Vol 52, No 1, Spring 2002; and Souvenir history of the Butte Fire Department, by Peter Sanger, Chief Engineer, November 1901 (source of historic photo, scanned by Butte Public Library). Modern photo (2008) by Richard Gibson. 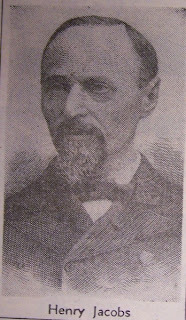 Henry Jacobs (1835-87), Butte’s first mayor (1879-80), was a native of Baden, Germany. He immigrated to America’s south at the age of nine, and fought for the Confederacy in the Civil War—he was at the siege of Vicksburg in 1863. He came to Montana in 1866, establishing his first clothing store in Diamond City, a gold-rush town in the Little Belt Mountains on Confederate Gulch north of Townsend. 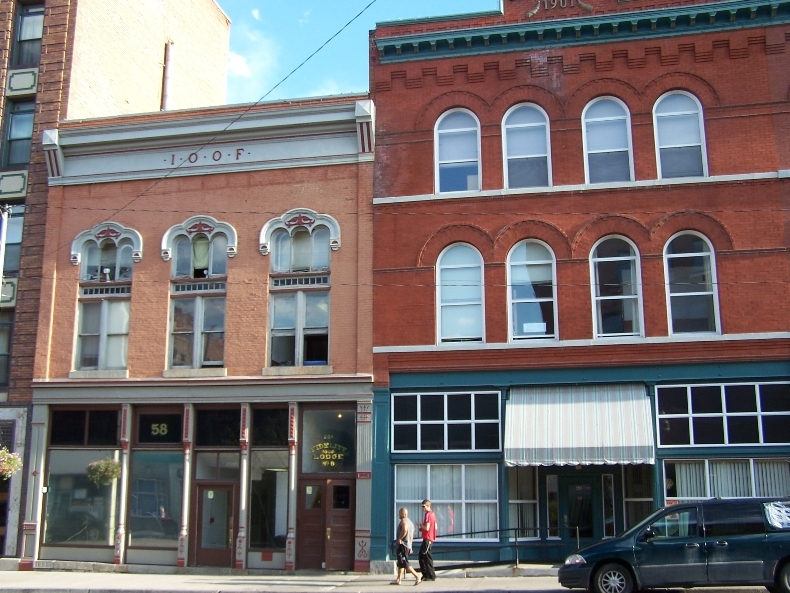 He located in Deer Lodge in 1869, and eventually moved to Butte in 1876 where he established the H. Jacobs and Company clothing store, located by the mid-1880s in the new Lizzie Block, corner of Park and Main (Party Palace today). After 1879, Jacobs was in partnership in his business with Herman Ganz of Helena. Jacobs and his wife, Adele (1839-1928), completed this charming home circa 1879. It was one of Butte’s early all brick residences, although today the brick is covered by stucco. The wrap-around porch is an early, if not original element of the house; it was present in 1884. Mr. Jacobs served as a school trustee, an officer of the I.O.O.F., and president of the Hebrew Benevolent Association. Both Adele and Henry Jacobs are buried in Butte’s B’nai Israel Cemetery, although Adele appears to have left Butte by about 1900. In 2013, the property was owned by the city and county of Butte-Silver Bow, which rents it to non-profit organizations for office space. Resources: Historical plaque by Montana Historical Society; A History of Montana, 1739-1885: A History of Its Discovery and Settlement, by Michael A. Leeson, 1885; photo of Jacobs published in Montana Standard Diamond Jubilee edition, June 13, 1954. Photo of house by Richard Gibson. Self-made multimillionaire William Clark spent an estimated $260,000 on the construction of this splendid thirty-two-room residence between 1884 and 1888. Though an astounding sum, that figure represented only a half-day’s earnings out of Clark’s seventeen-million-dollar a month income. The irregular architectural plan, a classic of Queen Anne styling, features porticos, arched windows, and elaborate decorative elements. The interior boasts finishing in a different wood for each room, frescoed ceilings, and possible Tiffany stained glass windows and chandeliers. The intricately carved staircase took four years to complete and was dismantled and displayed at the 1904 Worlds’ Fair in St. Louis. A stained glass window in the building was recently restored. 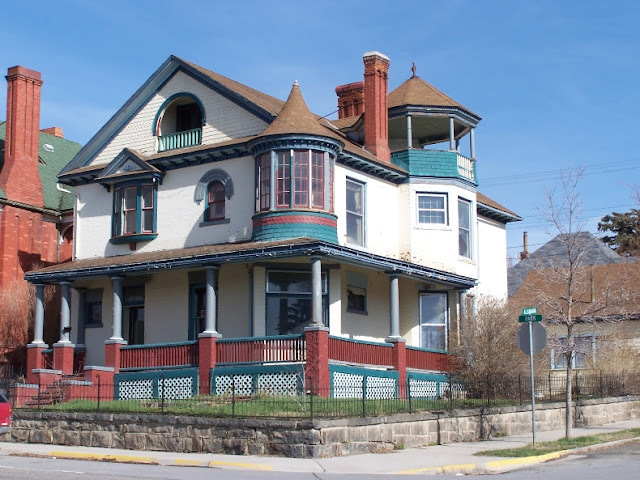 The mansion is independently listed on the National Register, as compared to automatic listing by virtue of being a contributing element of the Butte-Anaconda National Historic Landmark District (about 6,000 properties in Butte-Anaconda are National Register listed). Modified from historic plaque text by Montana Historical Society. Photo by Richard Gibson. Lawyers Robert McBride and Patrick Talent originally owned this three-story commercial/residential building designed by architect George De Snell. Built in 1905, it was one of several brick buildings that replaced frame stores, liveries, and brothels formerly occupying the street. Charles Cutler’s barbershop and Joseph Boulet’s bakery were early tenants. In 1910, the two opened the Iona Pool & Billiard Hall where Butler continued to give haircuts and sell cigars; Boulet moved the bakery and Iona Cafe to Main Street in 1915. When fire severely damaged the building in 1913, architect De Snell made the repairs and remodeled all three floors. The three tall arched bays, beautiful brickwork, and ornately carved stone on the upper two floors remain intact. 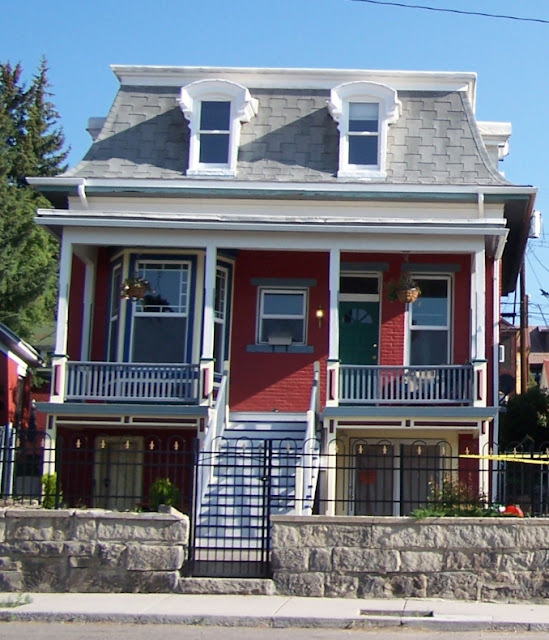 The changing character of East Park Street is well documented in the history of this rooming house, built as an investment in 1900 by Abraham Wehl. 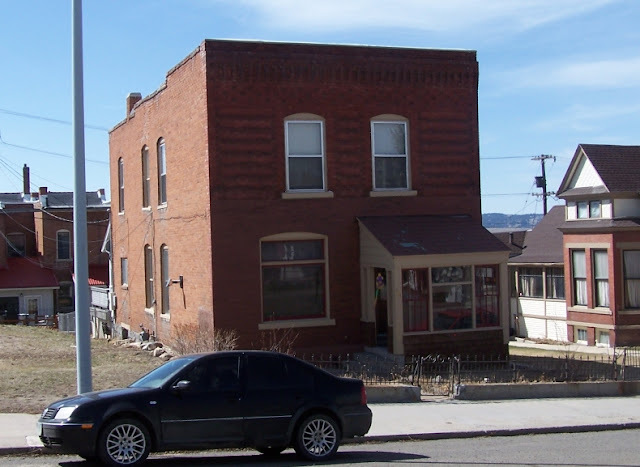 By this time, Butte’s first red light district, located on the block in the 1870s and early 1880s, had been firmly re-established to the south on nearby Galena and Mercury Streets. Handsome business blocks like this one, which replaced dilapidated mining camp buildings, brought some measure of respectability. Records show that residents at the Imperial were primarily miners and others who worked nearby but in 1910 under proprietress Mamie Smith, the fifty residents included nine prostitutes. Prohibition and reforms brought further change to the neighborhood evident by 1920 when Hugh Quinn, a family man with six children, was tenant landlord. His thirty-three roomers were all men (predominantly miners) or couples with children. Like most rooming houses of the time, second- and third-floor lodgings were arranged around a central skylight with ground-floor commercial space. The cast iron storefront, graceful upper-story arches, and decorative brickwork nicely represent turn-of-the-century Butte. Texts modified from historic plaques by Montana Historical Society. Photo by Richard Gibson. 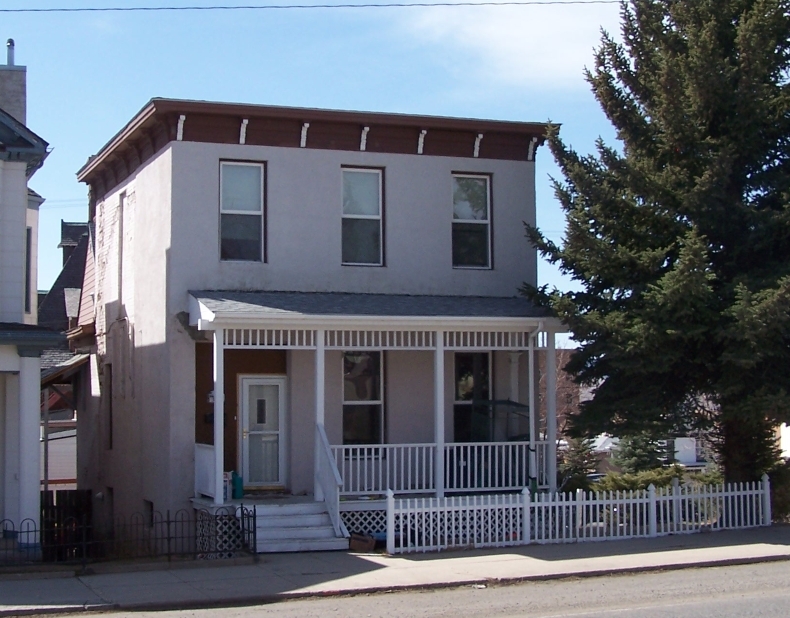 This two-level, two-resident shotgun house is typical of buildings erected on Butte’s narrow lots. Mine dumps from the Original Mine, directly north, and its precipitation plant just to the northeast were juxtaposed with the narrow residential district on Copper Street. The northwest corner of Copper and Arizona was occupied by a rooming house, with the Swedish Methodist Episcopal Church on the second floor; directly across the street, on the northeast corner, was the Gold Hill United Lutheran Church. Sandwiched between the mine yard and the large government and commercial buildings of Quartz and Granite Street, this tiny neighborhood was a microcosm of Butte’s intricately interconnected industrial, residential, and commercial zones. Space-saving innovations in the shotgun duplex include a roll-away bed that slides out of the dining buffet from beneath the adjacent bathroom floor. The building cost $2,800 when it was constructed. 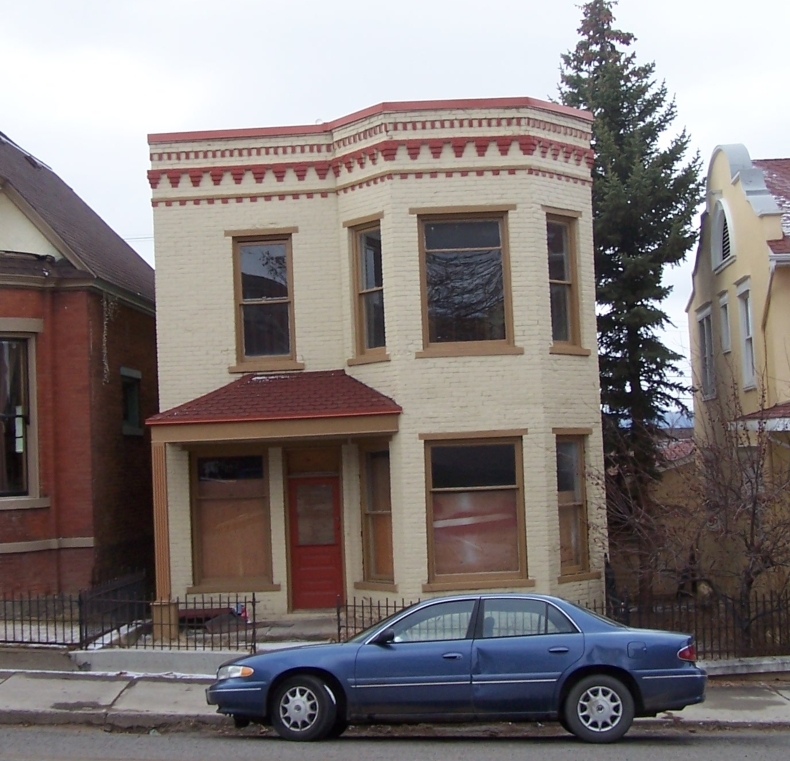 The wood frame and brick veneer are typical of Butte shotgun houses of this era; the original floor plan is intact. The rear stairway has been restored to the original design. Modified slightly from Vernacular Architecture Forum, Butte Conference Guidebook, 2009, p. 123, by Richard Gibson. 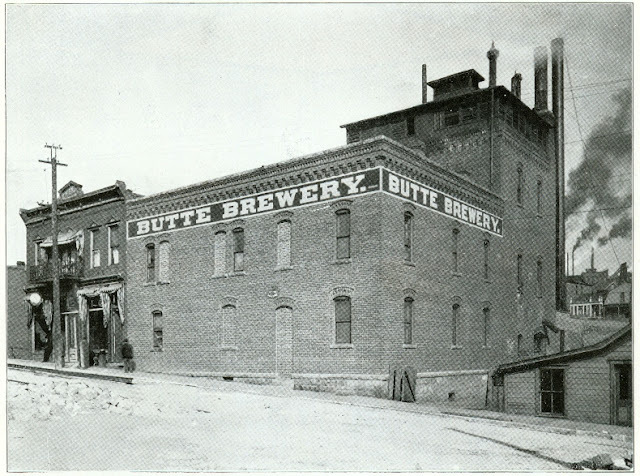 The Butte Brewery was established by Henry Muntzer in 1885, nine years after Butte’s first brewery, the Centennial. Beginning in the late 1890s, managers expanded production and built or re-built many of the brewery’s buildings on North Wyoming between Granite and Copper Streets. Capacity was expected to grow to 125 barrels per day in 1901, and the new malthouse was to handle 10,000 pounds per day. The brewery initially used water flowing in the stream that came out of Dublin Gulch, but by the early 1890s, that stream was filled and covered, and the brewery was on city water. The main building in the photo here was constructed in the late 1890s and included beer cellars in the basement of the 2-story section, with the fermenting floor on the ground level and lodge rooms on the second floor. The rear 3-story section held coolers, hop storage, a wash house, and the cooper shop. Multiple additional buildings covered the grounds, ranging from a bottling facility to stables. 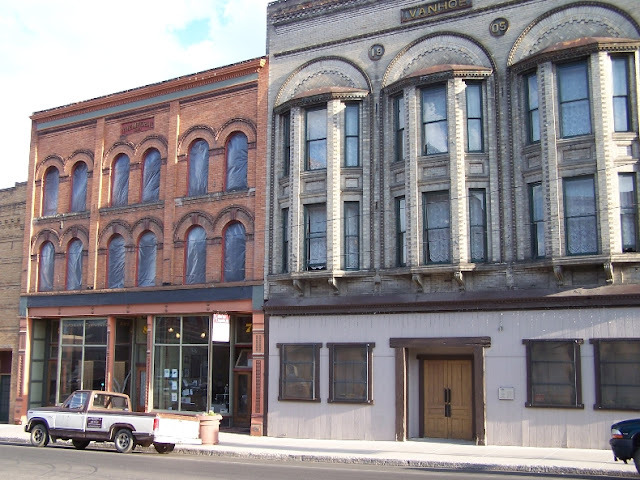 The building at left (224-226 N. Wyoming) with the decorative cornice was the Brewery Saloon, with the brewer’s residence above. Later that second-floor space became a hand-ball court. By 1910, T.J. Nerny was President. He got his start with the Citizens Brewery of Chicago in the 1890s, and came to Butte by about 1905. 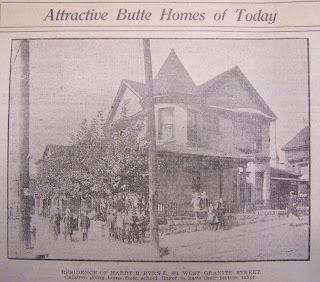 His home in 1910, when he was President of the Butte Brewery, was at 301 N. Alabama, and John Harrington, the brewery’s Secretary-Treasurer, lived up the block at 318 N Alabama. 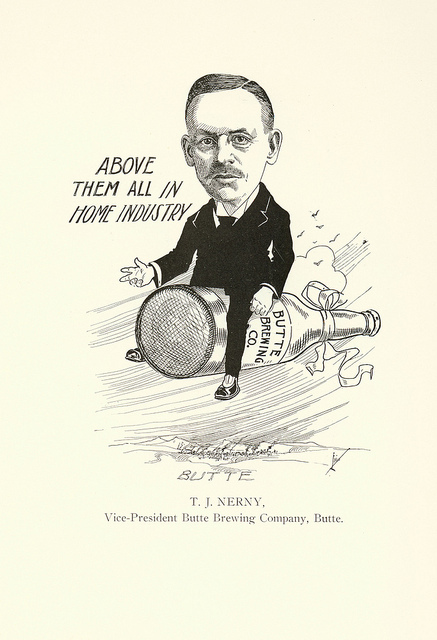 In 1917, with statewide Prohibition coming in 1919, the brewery promoted its Eureka Beer as “Liquid food for temperate people.” The Butte Brewery was the only one in Butte that survived Prohibition, by producing malted soft drinks and other beverages (using the Checo brand), but it did not survive the economic downturn that affected Butte in the 1960s and 1970s. They were out of business about 1963 and the brewery buildings were demolished soon after. Today the location is occupied by the Rodeway Inn (Capri Motel) (map). 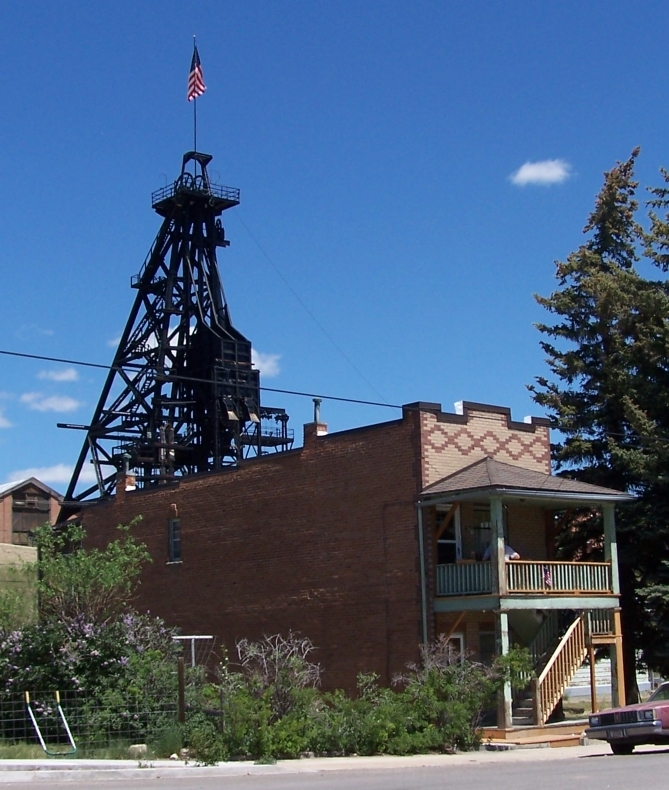 For 44 years, Butte did not have a brewery, until Quarry Brewing opened in 2007. In 2013, a new brewery is under construction on Butte’s east side that will resurrect the Butte Brewery name and brands. Image sources: scans by Butte-Silver Bow Public Library. Brewery, from A Brief History of Butte, Montana, by Harry C. Freeman, 1901. 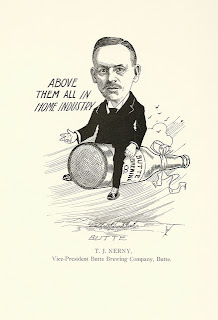 T.J. Nerny, Vice-President Butte Brewing Company, Butte, MT, image taken from p. 107 of Cartoons and Caricatures of Men in Montana (1907) by E.A. Thomson. Reference: Steve Lozar, "1,000,000 Glasses a Day: Butte's Beer History on Tap," Montana: the Magazine of Western History 56/4 (2006): 46-55. Additional resources: Sanborn maps, city directories. 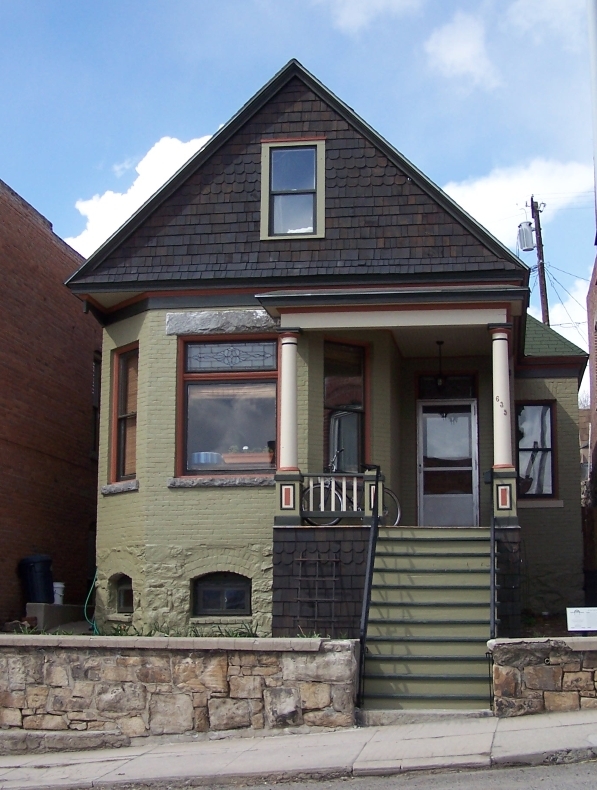 A corner location affords two views of this captivating home, built as a 1-story before 1884, with the second level added between 1888 and 1890. It was first owned by Butte attorney Thomas Napton. In 1890-91 this was home to Charles H. Palmer, Superintendent of the Butte & Boston Mining Company, who, a few years later, lived down the block at 410 W. Granite. By 1897, Eugene Carroll, who later became the long-time vice president and manager of the Butte Water Company, owned the property. He and his wife, Mary, resided here until the end of the 1940s. Although its builder is unknown, the home is a fine expression of the Italianate style and suggests the influence of a professional architect. Bracketed eaves, curved wraparound porch with square posts, and decorative cutwork trim above the windows richly ornament the design. A circular window, decorative frieze beneath the eaves, and ornamental porch brackets further embellish the elegant façade. Text modified from historical plaque by Montana Historical Society. Photo by Richard Gibson. 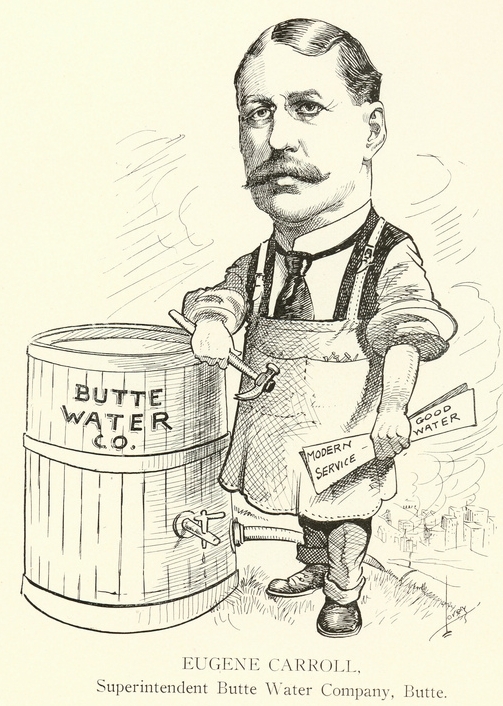 Image of Carroll from Cartoons and Caricatures of Men in Montana, by E.A. Thompson, 1907 (scan by Butte-Silver Bow Public Library). 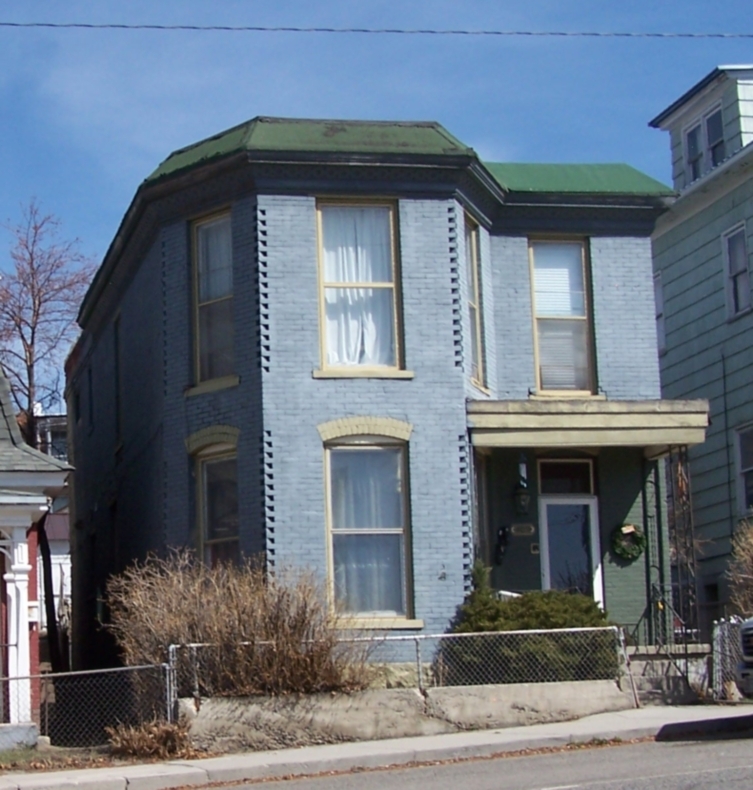 This small home, flanked by much fancier houses on both sides, was built as an investment by Undertaker E.H. Sherman as a brick-veneered one-story house about 1890. Sherman lived at 107 West Quartz at the time, a location today in the County Jail parking lot. 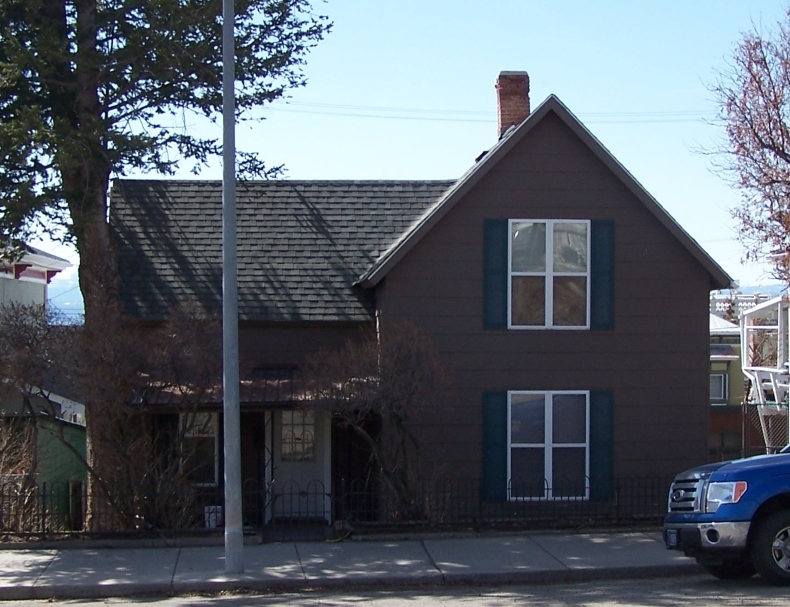 Bella Crangle, the long-time stamp clerk in the Butte Post Office, lived here with her family in 1902. In 1908, the second story was added by long-time owners, the Alex Gray family; Alex was a blacksmith. 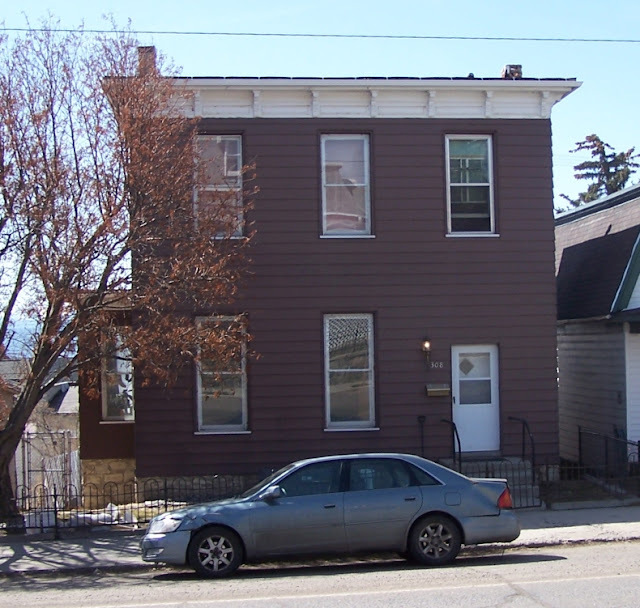 Together, the three adjacent houses constitute an excellent example of the close juxtaposition of diverse housing styles in Butte, even in the relatively upscale near West Side (Hub Neighborhood). In the late 1920s, Winnie Gray, widow of Alex, lived here with her son Alex Jr. The son worked as a mechanic at the Atlantic Garage, 45 West Galena (former location of Quarry Brewery, 2007-11). The garage was managed by Ernest Schwefel, who lived two blocks west of the Gray family, at 618 W. Granite with his wife Alice and sons Donald, Ernest Jr., and William. Winnie owned and rented the house into the 1970s, when Butte Archivist Irene Rice (Scheidecker) was a tenant. This property was sold by Butte-Silver Bow County in 2006 under the developer’s packet process for $500. The new owner did major rehabilitation on both the exterior and interior; the house was vacant until 2013 when a new owner acquired it. Resources: City directories; Sanborn maps; Butte-Silver Bow Developer’s Packet; Architectural Inventory at Butte-Silver Bow Public Archives. Photo by Richard Gibson. Butte’s architectural diversity is legendary, and this Mission style home adds to that reputation. The Mission style traces its roots to Hispanic California and in Montana, it most frequently appears in civic, rather than residential, buildings. Butte’s copper king W. A. Clark, for example, employed the style for his celebrated Columbia Gardens amusement park. 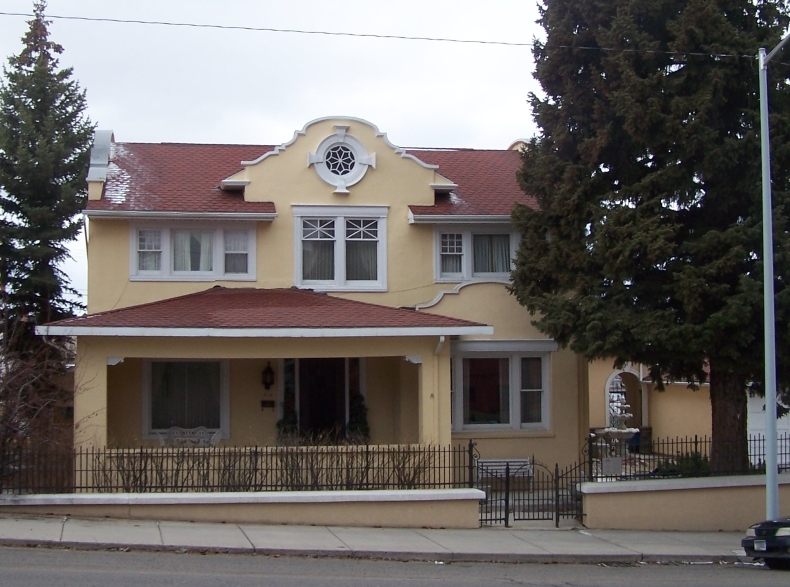 This is Butte’s only residential example of the style. 414 W. Granite in 1909. A stucco exterior; heavy, square columns; and a shaped parapet are the style’s hallmarks. The stucco covers all-concrete exterior construction, a much-touted building material in 1908. Its rich interior features ceilings with exposed beams, inlaid floors, and oak, teak, and walnut woodwork. The original cloth tapestry wallpaper and an exquisite stained glass window grace the dining room. Arthur L. Schimpf acquired title to the property from the Joseph Schlitz Brewing Company and built the home in 1908, at a cost of $17,000, a very handsome sum at the time. Schimpf was the proprietor of the famous Atlantic Saloon on the south side of Park Street between Main and Dakota, a Butte fixture that reputedly had the longest bar in the world. Longtime property owners Michael L. and Christy McGrath, also bar owners, brought an additional unique connection: Christy’s grandfather was once a bartender at the Atlantic Saloon. Source: Expanded from historic plaque text by Montana Historical Society; additional resource: Anaconda Standard, Dec. 19, 1909 (historic photo). Modern photo by Richard Gibson. The Grace Methodist Episcopal congregation was organized in 1888 to serve South Butte, although a mission in South Butte had begun about 1879. They erected their church on the northwest corner of Arizona and Second Streets in 1889. Montana's second state governor, John Rickards (served 1893-97), was on Grace's initial board of directors. In 1910, membership was 140 under Pastor W.H. Pascoe, who lived at the church. Over time, the address scheme changed here, from the 200 block of Arizona when it referred to the separate community of South Butte, to 945 and 939 South Arizona after the address became part of the Butte grid. 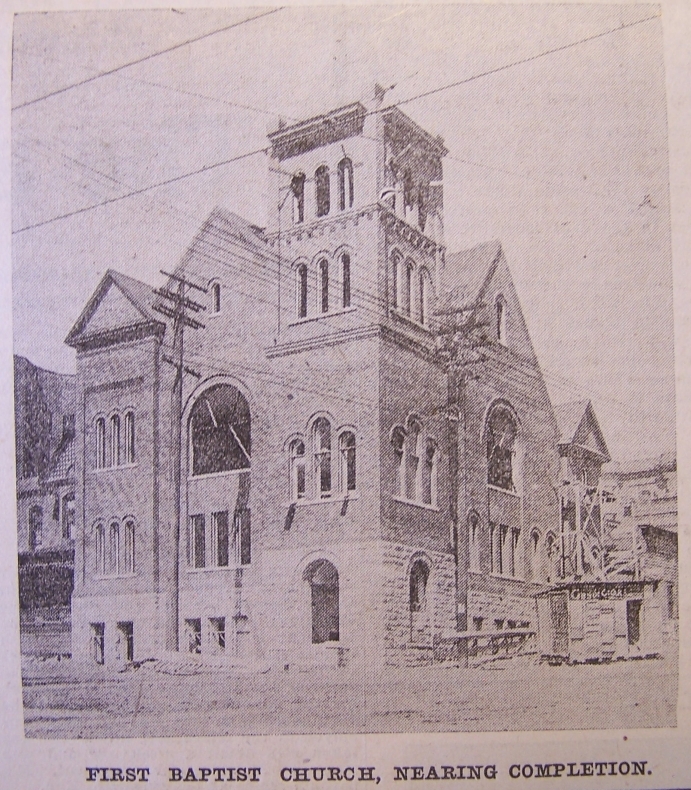 The original 1889 church was significantly expanded and modified in 1902, including the addition of the corner spire. 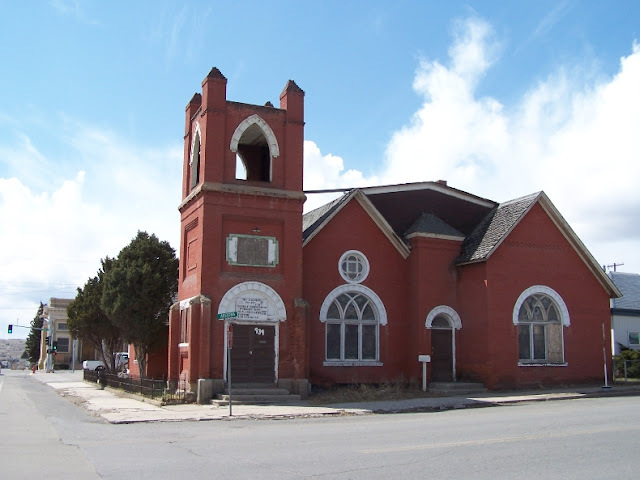 In 2013, the church is vacant and privately owned, with restoration in the offing. Resources: Anaconda Standard and Butte Miner, January 26-29, 1910; Sanborn Maps; City Directories; Methodism on the Richest Hill on Earth, by Mike Parr. Photo by Richard Gibson. Immigrants to Butte during the mining boom often lived, socialized, and worshiped with fellow nationals. Swedish Lutherans first congregated in 1896, and in 1901 they built a small wooden chapel on the back of this lot. They quickly outgrew the building, which was a mattress factory when it burned in 1937. In 1912, the congregation, which kept its early records in Swedish, began construction of this brick church at a cost of $15,000. It was completed and dedicated in 1916. Modest compared to neighboring St. Mark’s (a German Lutheran church), Emanuel Lutheran’s most prominent feature is its octagonal spire, which rests on a wooden tower ornamented with pinnacles and projecting gables. The steep pitch of the gables, lancet-arched tracery windows, and diagonal buttresses capped with contrasting sandstone trim all mark the church’s design as Gothic Revival. 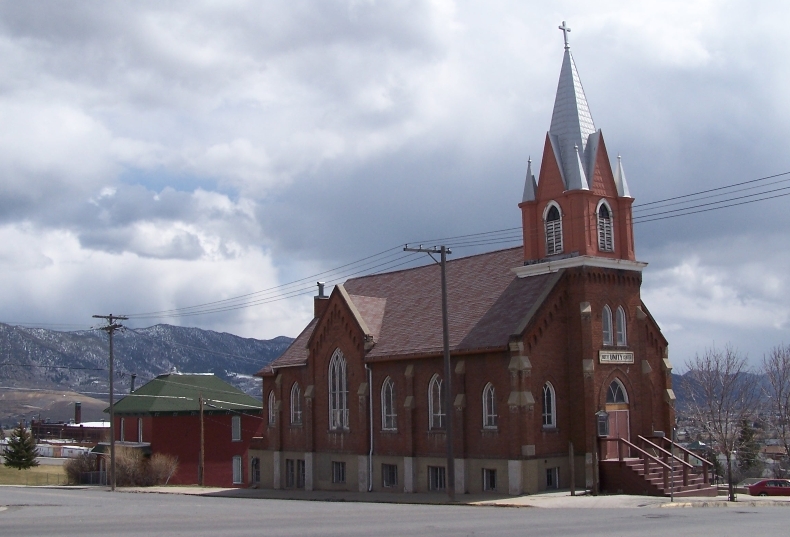 Butte Unity Truth Center, a nondenominational Christian church, purchased the building in 1958 when Emanuel Lutheran followed its congregants to the flats. By then Emanuel Lutheran no longer exclusively served Swedes; its days as an immigrant church—bringing comfort to worshipers far from home—were over. The Unity Center continues to use the building in 2013. French Canadian brothers Arthur and Joseph Nadeau built this house of prostitution in 1890. Reflecting the architecture of the trade, each room features a door and window so customers could “shop.” In 1900, when Grace McGinnis was madam, the Dumas was in the heart of the red-light district, an area roughly two blocks square and crowded with saloons and gambling halls. 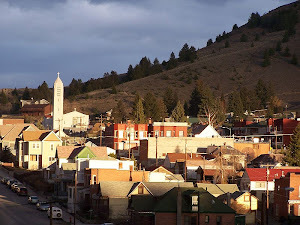 Butte’s district was the second largest in the West, after San Francisco’s Barbary Coast. An estimated 2,500 working girls plied their trade in Butte at the peak of population in the 1910s and 1920s. Prostitutes worked everywhere from squalid alley “cribs” to high class “parlor houses” such as the Dumas. Prostitution, although never legal in Butte, was tolerated as a necessity for miners and “gentlemen” alike. The district faded as years passed, but women at the Dumas serviced customers until 1982. The last madam, Ruby Garrett, died in Butte in 2012. See also this story connected with Ruby Garrett. The second-floor hallway is expanded to accommodate a balcony and skylight bringing light to both floors. 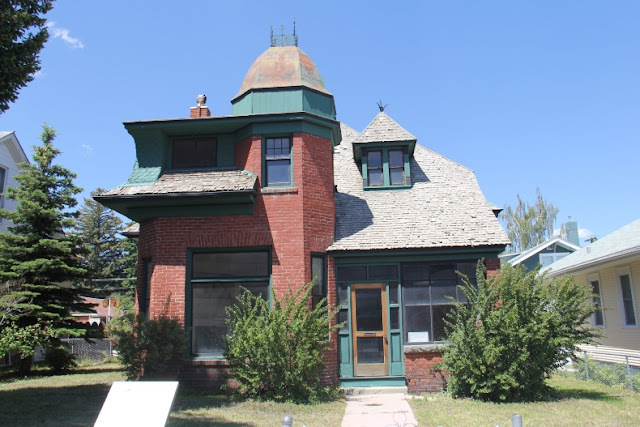 In 2007-2008, private donations, mostly from John “Curt” Button, allowed Butte Citizens for Preservation and Revitalization to replace the roof and crumbling load-bearing interior masonry. In 2012, new owners began aggressive revitalization and returned the building to use as a viable museum. More information about the 2007-08 restoration here. Sources: Historic plaque text by Montana Historical Society; Vernacular Architecture Forum, Butte Conference Guidebook, 2009, p. 107-108, by Richard Gibson. 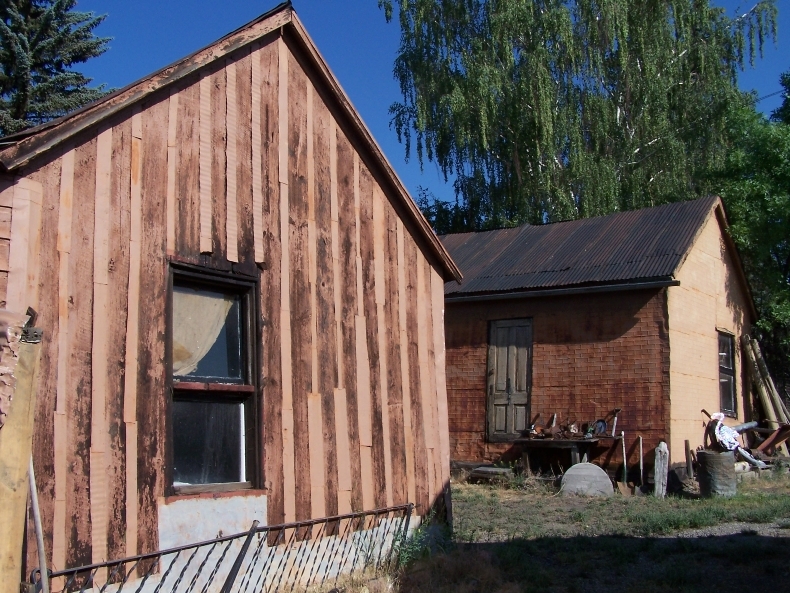 These shacks and outbuildings were at the extreme north end of the shanty town that grew up in the 1880s on the near southeast side of Butte’s main business district. The “Patch” was home to bootleggers, drunks, prostitutes, poor families, newly arrived immigrants, widows with children, criminals, and other down-on-their luck residents. Construction is truly vernacular, using available materials, scavenged or stolen from waste piles, mine yards, and elsewhere. In 1916, the Cabbage Patch extended approximately from Arizona Street on the west to Oklahoma St. on the east, and from Galena (and its extension) on the north to Platinum or Porphyry on the south. Most of the buildings – more than 200 – were razed in 1940-41 to make way for Silver Bow Homes, the ranks of low-income apartments that still stand south of Mercury Street. At about the same time, the buildings here were converted to garages, with addition of flooring and large garage doors. When used as residences, these places had dirt floors, and no electricity, running water, or sewer systems. Important original elements include scraps of linoleum and loose fabric used as wallpaper and insulation, and pressed tin and wood timber walls. The name reflects the frequent use of cabbage in meals—that smell, combined with that of the open sewer that wound its way through the district, contributed to the seedy feel of the neighborhood. 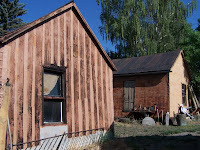 The surviving buildings of the Cabbage Patch are part of a tour with Old Butte Historical Adventures. Modified slightly from original publication in Vernacular Architecture Forum, Butte Conference Guidebook, 2009, p. 102-103, by Richard Gibson. Additional resource: Butte Voices, by Pat Kearney, Skyhigh Communications, 1998. Photos by Richard Gibson. Fraternal organizations were an important facet of most mining towns and helped establish social and civic stability in early communities. Members of Fidelity Lodge #8 constructed this meeting hall, one of the district’s oldest standing buildings, in 1884. The building’s dual function, with second-story meeting rooms and first-floor commercial space, is typical of the period. 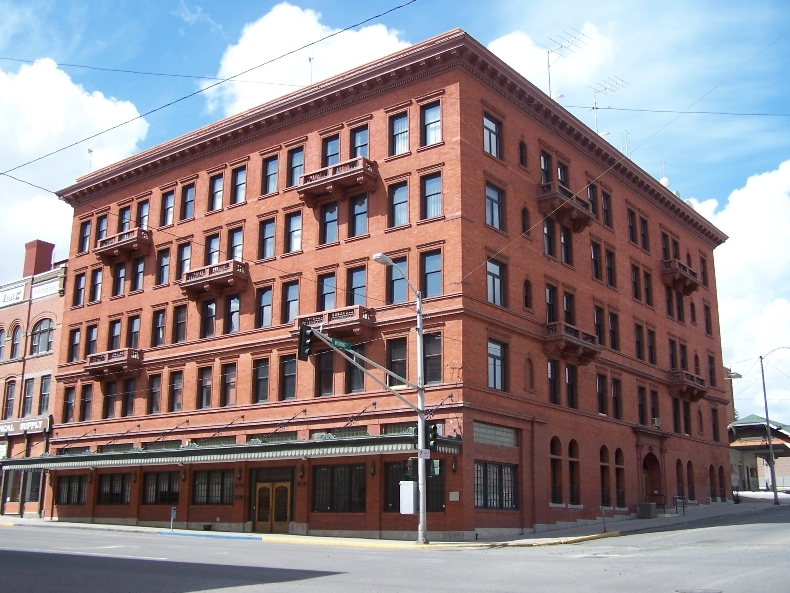 The lively façade, enhanced with intricate prefabricated details, directly reflects the impact of the railroad upon Butte’s architectural landscape. Ready-made elements such as the cast-iron storefront with scrolled columns and Corinthian capitals, metal cornice with decorative brackets, and floral-patterned window hoods were shipped by rail, linking Butte to national architectural trends. Minor repairs were conducted in 1898 (joist work) and 1908 (glass front replacement). The letters "IOOF" are mounted upon the metalwork cornice. From historic plaque text by Montana Historical Society. Additional resource: Historic Uptown Butte, by John deHaas, 1977. Photos by Richard Gibson. 401 West Granite in 1913. 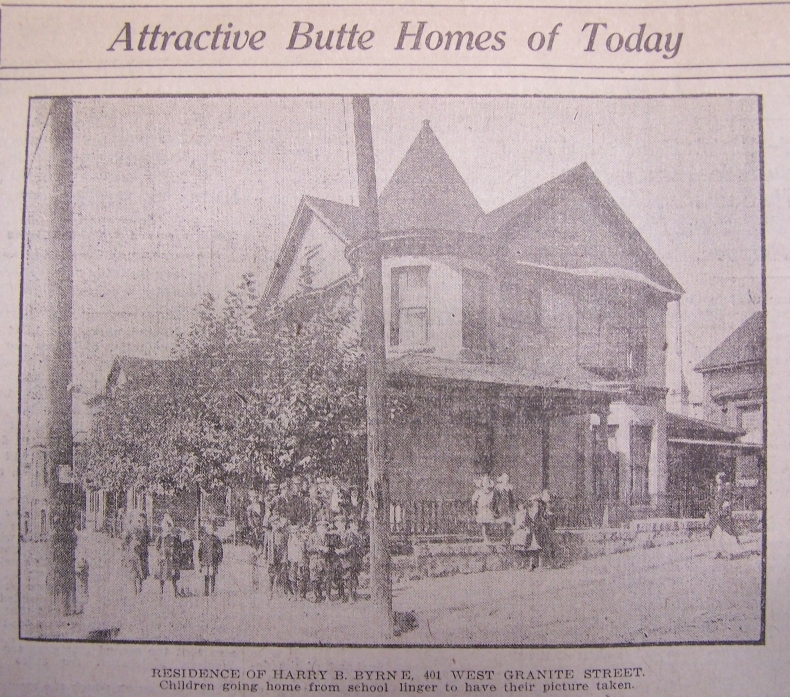 After Leggat left Butte in 1913, the next owner was Harry Byrne, Butte manager of Paine Webber stock brokerage. A later longtime owner was Dr. Thomas J. Murray, who came to Butte in 1885 after proving his medical skills in the dangerous back-water swamps of Mississippi. Murray, who died in 1930, long operated a private hospital in Butte and was influential in securing legislation that created the state board of medical examiners. Although its many rambling rooms have long been divided into rentals, the nineteenth-century essence of this beautiful home is untouched. Modified from historic plaque text by Montana Historical Society. Historic photo from Anaconda Standard, Nov. 5, 1913; modern photo by Richard Gibson. 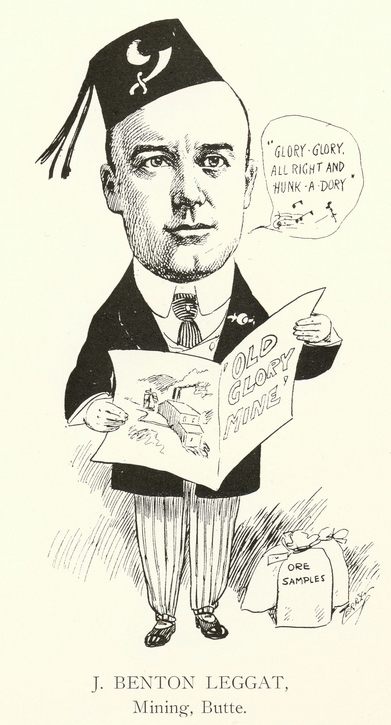 Image of Leggat from Cartoons and Caricatures of Men in Montana (1907) by E.A. Thomson (scan by Butte Public Library).